Making friends is a big part of being a kid. Kids can make friends at school and at other extracurricular activities but there is something special about friendships forged on a Smoky Mountain sports team. Young athletes spend countless hours as a unit and learn to work together like no other group of kids. Years from now, your children may have their own kids, and they will tell them about their past sports days when they met their best friends. Being able to work with others is an important part of being a successful adult. One of the best ways your child can learn how to work with others is by joining a Smoky Mountain sports team. On a sports team, kids have to work together for a common goal, and if they don’t work together they won’t succeed. Your child will spend a lot of time with his or her teammates learning how to work together, and they will take these lessons with them for the rest of their lives. Living a healthy lifestyle starts at a young age and continues on into adulthood. One of the best ways to stay fit is by playing on a Smoky Mountain sports team. Getting involved with team sports can be the first steps of living a healthy lifestyle, and if your kids enjoy the sport, they will continue to play for years to come. Even if your kids outgrow a particular sport, they will continue their healthy lifestyle habits. Children that play sports also develop stronger muscles and bones, which will make them more resistant to injuries as they age. Being part of a team with similar goals can increase the value children place in themselves. As they continue to grow in the sport and develop into a stronger and more skilled player, their self-esteem will grow. Likewise, as they are praised by you, their coaches, and their teammates for their contributions to their Smoky Mountain sports team, their self confidence will be bolstered. This self-esteem and confidence will follow them throughout life, and will contribute to them becoming successful adults. Children require lots of guidance because they have either not experienced or learned how to make the right decisions yet. Though parents and guardians are the ultimate mentors, participating in youth sports gives athletes the opportunity to meet positive role models, such as coaches and parent volunteers, who will guide them as they grow as players and as people. Sign your children up for one of our Smoky Mountains sports leagues or camps today, to give them a great opportunity to have fun and grow! This entry was posted in Our Gatlinburg Sports Complex on February 22, 2016 by Jason Fishman. 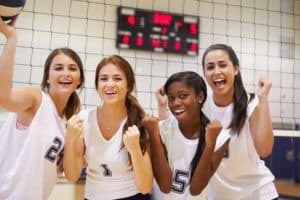 Previous PostCNN Report Details How Team Sports Help Women Succeed ProfessionallyNext PostShould Young Athletes Specialize in Only One Sport?